Dr. Willett offers eye-opening new research on choosing foods with the best types of carbohydrates, fats, and proteins, and the relative importance of various food groups and supplements. He clearly explains why controlling weight, after not smoking, is the single most important factor for a long, healthy life; why eating some types of fat is beneficial, and even necessary, for good health; how to choose wisely between different types carbohydrates; how to pick the right protein “packages”; and what fruits and vegetables—not juices!—fight disease. Dr. Willett also translates this essential information into simple, easy-to-follow menu plans and tasty recipes. Revised and updated, this new edition of Eat, Drink, and Be Healthy is an important resource for every family. It’s a simple, obvious truth. You need food for the basics of everyday life—to pump blood, move muscles, think thoughts. But what you eat and drink can also help you live well and live longer. By making the right choices, you can avoid some of the things we think of as inevitable penalties of getting older. Eating well—teamed with keeping your weight in the healthy range, exercising regularly, and not smoking—can prevent 80 percent of heart attacks, 90 percent of type 2 diabetes, and 70 percent of colorectal cancer.1 It can also help you avoid stroke, osteoporosis, constipation and other digestive woes, cataracts, and aging-related memory loss or dementia. And the benefits aren’t just for the future. A healthy diet can give you more energy and help you feel good today. Making poor dietary choices—eating too much of the wrong kinds of food and too little of the right kinds, or too much food altogether—can send you in the other direction, increasing your chances of developing one or more chronic conditions or dying early. An unhealthy diet during pregnancy can cause some birth defects and may even influence a baby’s health into adulthood and old age. When it comes to diet, knowing what’s good and what’s bad isn’t always easy. The food industry spends billions of dollars a year to influence your choices, mostly in the wrong direction. Diet gurus promote the latest fads, most of which are less than healthy, while the media serves up near daily helpings of flip-flopping nutrition news. Supermarkets and fast-food restaurants also offer conflicting advice, as do cereal boxes and thousands of websites, blogs, Facebook pages, and tweets. The federal government, through its Food Guide Pyramid, MyPyramid, and MyPlate images, aimed to cut through the confusion but ended up giving misleading and often unhealthy recommendations (see chapter two) that benefit American agriculture and food companies more than Americans’ health. While the average American diet still has a long way to go before it can be called healthy, it has improved over the past decade or so in spite of the babel of nutrition information. Several of my colleagues and I looked at the diets of almost 34,000 Americans who took part in the National Health and Nutrition Examination Survey between 1999 and 2012. This survey, conducted every year, gauges the diet, health, and nutritional status of a sample of adults and children in the United States. We rated the diet of each participant using a tool we developed that assigns higher points to healthy components of the diet, like eating whole grains and unsaturated fats, and lower points to unhealthy components, like eating red meat and drinking sugar-sweetened beverages. The highest score, 110, indicates the healthiest diet possible. We were delighted to report that the quality of the American diet improved between 1999 and 2012.2 Consumption of artery-damaging trans fats declined by 80 or 90 percent, and Americans drank about 25 percent fewer sugar-sweetened beverages. On average, people ate slightly more fruit, whole grains, and healthy unsaturated fats. Our study showed that the average American diet still wasn’t very healthy—rating 48 points out of 110—and that poorer individuals and those with less education have poorer diets than wealthier and better-educated individuals. And this gap looks like it is increasing over time. Yet, these modest improvements in diet quality had an astounding impact on the health of the nation. Between 1999 and 2012, we estimated that these changes prevented 1.1 million premature deaths from heart attacks, strokes, cancer, and other causes, and 3 million cases of type 2 diabetes. But there’s more work to be done, since the “average American diet” in this study wasn’t that great. The eating strategies described in this book will help you make a great diet and reap not only the benefits described in this study but many more as well. I wrote Eat, Drink, and Be Healthy in 2001 to cut through the confusion about diet. Basing the book on the most reliable scientific evidence available then, I offered recommendations for eating and drinking healthfully. Sixteen years and thousands of scientific papers later, the recommendations in this edition of the book are fundamentally the same, though supported with more extensive evidence and enhanced with important new details. That’s encouraging, because it means that, with careful attention to the types and strength of studies, we can make conclusions about healthy eating that withstand the test of time and deep scientific scrutiny. However, the book needed to be updated, because far too many Americans are still confused about what constitutes a healthy diet and are looking for the best available information. Even more encouraging is that national recommendations on healthy eating, called the Dietary Guidelines for Americans,3 have been inching closer to what I advised in 2001 and still advise today. I can’t quite rival the brevity of food writer Michael Pollan’s seven-word dietary credo, “Eat food. Not too much. Mostly plants.”4 That’s a decent general overview, but it doesn’t offer much real guidance. That’s exactly what this book provides. • Eat plenty of vegetables and fruits, but limit fruit juices and corn, and hold the potatoes. • Eat more good fats (these mostly come from plants) and fewer bad fats (these mostly come from meat and dairy foods). • Eat more whole-grain carbohydrates and fewer refined-grain carbohydrates. • Choose healthy sources of protein, limit your consumption of red meat, and don’t eat processed meat. • Drink more water. Coffee and tea are okay; sugar-sweetened soda and other beverages aren’t. • Take a multivitamin for insurance, just in case you aren’t getting the vitamins and minerals you need from the foods you eat. Make sure it delivers at least 1,000 international units of vitamin D.
Since the last edition of the book, many studies have supported the benefits of a primarily plant-based diet. This doesn’t mean you must go vegan or vegetarian. Even a partial shift away from a meat- and dairy-centered diet and toward more plant sources of protein is a big step in the direction of long-term good health for you and planet Earth (see chapter twelve). If swearing off meat isn’t for you, think about trying the “vegan till 6” plan favored by New York Times food writer Mark Bittman. Or experiment with the popular Meatless Monday movement and one day a week—choosing Monday makes it easy to remember, but it could be any day—not eat any meat. While many food experts (Pollan, Bittman, and myself among them) agree with a plant-based diet, the USDA hasn’t been entirely on board with it. You can see that in MyPlate, a less-than-healthy infographic the USDA cooked up to summarize the dietary recommendations in the 2010 Dietary Guidelines for Americans (see chapter two). To counter that flawed information, I and several of my colleagues at the Harvard T.H. Chan School of Public Health, in collaboration with Harvard Health Publications, distilled the best evidence about healthy eating into the Harvard Healthy Eating Plate. This visual, evidence-based guide makes it easy to choose the healthiest options. It’s also an important alternative to the USDA’s misleading My Plate (see chapter two). The main message of the Healthy Eating Plate, like its older sibling, the Healthy Eating Pyramid, is to focus on diet quality. • Celebrate vegetables and fruits: Cover half of your plate with them. Aim for color and variety. Keep in mind that potatoes don’t count (see “The Spud Is a Dud” on page 167). Figure 1. The Harvard Healthy Eating Plate was created to address deficiencies in the USDA’s MyPlate. It provides simple but detailed guidance to help people make the best eating choices. • Go for whole grains—about one-quarter of your plate. Intact and whole grains, such as whole wheat, barley, wheat berries, quinoa, oats, brown rice, and foods made with them, have a milder effect on blood sugar and insulin than white bread, white rice, and other refined grains (see chapter six). • Choose healthy protein packages—about one-quarter of your plate. Fish, chicken, beans, soybeans, and nuts are all healthy, versatile protein sources. Limit red meat, and try to stay away from processed meats such as bacon and sausage (see chapter seven). • Use healthy plant oils, such as olive, canola, soy, corn, sunflower, and peanut, in moderation. Stay away from foods containing partially hydrogenated oils, which contain unhealthy artificial trans fats (see “Trans fats,” page 83). If you like the taste of butter or coconut oil, use them when their flavor is important but not as primary dietary fats. Keep in mind that low-fat does not mean healthy (see chapter five). • Drink water, coffee, or tea. Skip sugary drinks. If you enjoy milk, don’t have more than two glasses a day (see chapter nine). If you drink alcohol, keep it moderate—no more than two drinks a day for men, no more than one a day for women. • Exercise. It’s good for overall health and controlling weight. Using the blueprint laid out in the Harvard Healthy Eating Plate is a good way to improve your diet. But I also want you to see the evidence on which it was built. This is detailed in chapters four through eleven. In them, I describe the classic and cutting-edge research that has defined and refined eating patterns that will help keep you healthy, including new information on slowly digested carbohydrates; what kinds of fruits and vegetables are particularly important to include in your diet; what protein can and can’t do; how to put the omega-3 fats found in fish and some plants to work for you; the potential hazards of consuming too much milk and other dairy foods; and why it makes sense to take a daily multivitamin. This book helps you incorporate this information into your snacks and meals with practical tips on buying healthy foods and eating defensively in a food environment that entices you to eat in ways that can prematurely end your life. It offers extra information to help individuals with special nutritional needs get the most benefit from what they eat. These include pregnant women, frail older individuals, those with celiac disease, and those with or at high risk of heart disease, diabetes, high cholesterol, high blood pressure, or some other chronic conditions. It ends with more than seventy tasty tested recipes. This information isn’t meant to replace the advice you get from your physician, especially if you have a condition that requires a specific diet. Instead, I encourage you to talk with your health care provider about your diet and share with him or her what you’ve learned from this book to make sure you are talking the same language about healthy eating. Keep in mind that most physicians-to-be get little education about nutrition in medical school or beyond. And the pressures of modern medicine and health care often make it difficult for clinicians to keep up with the field of nutrition, let alone spend time talking with their patients about healthy food choices. You may find yourself teaching your health care provider. Not long ago my cholesterol began creeping up. Much to my dismay, my doctor recommended that I start a low-fat diet—a recommendation from the 1980s that we now know doesn’t work for lowering cholesterol. This book will help you stay healthy and educate your doctor if you need to. 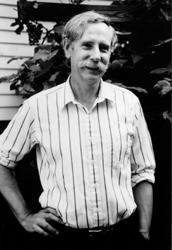 Walter C. Willett, MD, DrPH, has led the Department of Nutrition at the Harvard T.H. Chan School of Public Health for twenty-five years and is Professor of Medicine at Harvard Medical School. A world-renowned researcher, he is a lead investigator of the landmark Nurses’ Health Study and Health Professionals Follow-up Study. Dr. Willett has won many honors, including the Mott Prize, the prestigious award of the General Motors Cancer Research Foundation. Coauthor Patrick J. Skerrett, the former Executive Editor of Harvard Health Publications, is the editor of First Opinion at STATnews.com. "Uniquely knowledgeable, equally wise, unfailingly thoughtful, and deeply concerned for the well-being of people and planet alike, there simply is no better guide to dietary health- anywhere- than Walter Willett- and no better guidance than 'Eat, Drink, and Be Healthy.' 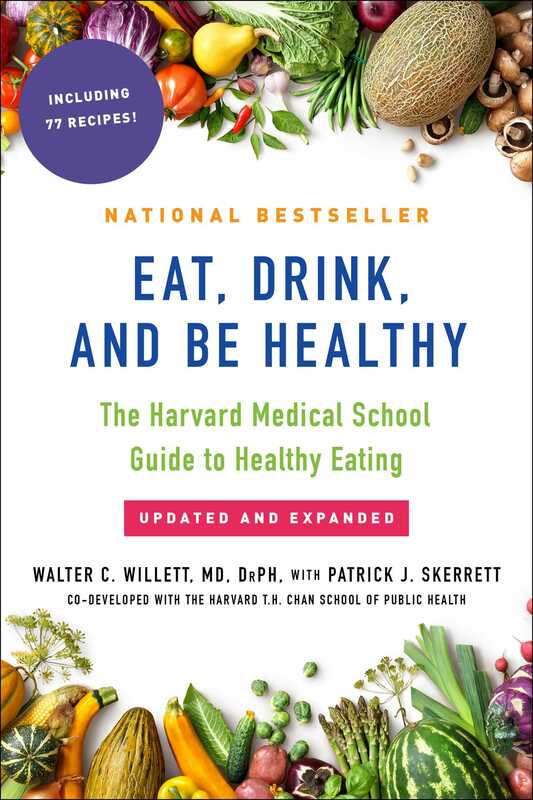 "
“In this updated edition of Eat, Drink and Be Healthy, Dr. Willett, one of the world’s pre-eminent nutrition researchers, explains the latest evidence to help us all thrive, and live longer lives. And for home cooks, professional chefs, and food lovers everywhere, this must-read elegantly bridges nutrition and culinary strategies in ways that honor the cause of deliciousness and the pleasures of sharing food with family and friends."